The Mission Critical ETI0014-D8 (D8 for short) is ideally suited for criticalapplications requiring rugged rack or table mount and/or portable construction, highreliability, compact size and light weight design. 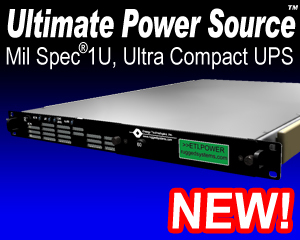 The heavy duty chassis occupies only5Uof rack space while accommodating up to eight half height, shock mounted, mass storagebays powered by four redundant 65 watt power supplies. Each bay can have mounted eitherone full height or two half height or three slim height devices. The front panels provideaccess to either two full height or four half height devices with removable media (i.e.floppy disks, tape cartridges, CD-ROMs, or optional drive shuttles). The rounded metalcorners and rugged handles, aid in safe handling. The chassis has threaded inserts forfour of the more commonly used rack slides. The optional mounting kit includes flanges andlegs for horizontal or vertical mounting other than rack. Internally, all major componentsare well secured and electrically insulated to prevent damage due to shock and vibration.Additionally each drive bay is shock mounted within the chassis. The universal inputselects from either domestic or international voltages automatically. The LED arrays keepthe operator informed as to the power and activity status of each device. Controls andprotective devices are brought to the front control panel which is recessed to preventdamage or accidental operation. The input switch, fuses and wiring provide double poleisolation for shipboard systems. A bi-directional single-ended to differential SCSIconverter option allows the mixing of both single-ended and differential SCSI devices onone SCSI bus. This option is available for either Fast SCSI-2 or Fast-Wide SCSI-2 andSCSI-3. The rear panel provides four interface panel positions. Interface panel options areavailable for all standard SCSI connectors. These can be mixed and matched to suit aparticular configuration. An optional SCSI ID selector switch panel allows externalsetting of device IDs. Dual washable intake air filters and high capacity ball bearingfans provide added protection in both controlled and hostile environments. The cooling airis diverted out the front vents after passing by both top and bottom of each device. Overall, the Mission Critical line is uniquely qualified for criticalshipboard, vehicle, airborne or land based systems combining advanced modular designfeatures with highly reliable construction. For information on ETI's rugged removable disk drive carriers, check out ETI0014-DE200that are hot swappable, RAID compatible and withstand shock and vibration.